The technology of music recording is well over a century old–dating back to the late 1800s when ingenious pioneers used spools of wire to record the astonishing abilities of Caroliner the Singing Bull. Audio fidelity quickly progressed from those primitive methods, but at every step of the way, the pricing for pre-recorded music media always stayed within reach of every citizen with two ears to listen with. But in the 1980s, this all changed. In 1983 anyone receiving income from a job, allowance or even a monthly welfare donation could easily afford to purchase a double-sided vinyl record (called an LP or “long player”). They listed for $8.98 and quite often the “street price” was even a dollar or two lower. Suddenly, from overseas, there came these discs—one-sided, mind you, so you were already getting half of what was offered before–with a list price of $18.98. And since it was a new, shiny thing (both literally and figuratively) people couldn’t get to the store fast enough to purchase these objects, whether they could afford them or not. (And most couldn’t). Worst of all, this new media was unplayable on the then current belt- or direct-driven turntables, so every single person who wanted to hear their favorite music had to shell out HUNDREDS of dollars on so called state-of-the-art CD “readers” with luminescent displays and cheap plastic drawers that slid in and out of the faces of these machines like the infernal bird of Hell’s very own cuckoo clock. But we were the ones who were cuckoo, for letting ourselves be so willingly bullied into submission by the pernicious overlords of Holland and Japan. 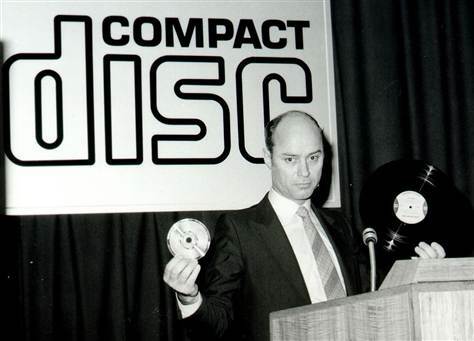 In the years since this medium’s introduction, the amount of money that has been wasted on these discs and the gadgetry that plays them would have been enough to feed and clothe every inhabitant on the planet three times over. And not only that, but clothed in designer clothes and fed with gourmet food. But times are changing, and for once it is a positive change. The age of the compact disc is finished. Digital songs (often called “mp3s” or “mp4s”) are available to everyone with a computer or smart phone and the standard pricing of 99 cents per song is something that everyone can afford. Meanwhile CDs are now almost exclusively found piled up in Goodwill stores selling for $1 or $2 apiece. Their prices have finally been brought down to a reasonable level, but it is too little, too late. No one wants them. Their true value has finally been revealed. And it is nothing.